MADISON, Wisc. 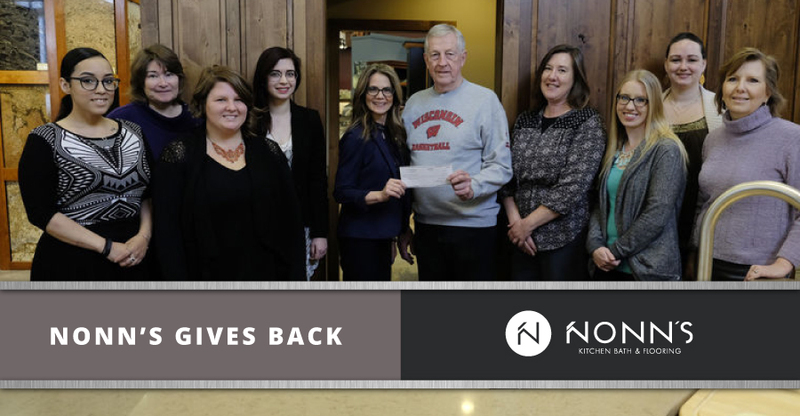 — Through recent volunteer efforts and donations, Nonn’s shows that giving back to the community is a top priority. In a friendly food drive competition between their Madison, Middleton, and Waukesha locations, the flooring, cabinetry, countertop, and appliance retailer ran with the chance to lend a helping hand and raised $2,000 and over 1,400lbs of food. The donations were then given to The Sunshine Place and Middleton Outreach Ministry. Both of these local charities strive to end hunger in Dane County. The Sunshine Place Food Pantry, which is based in Sun Prairie, feeds thousands of Wisconsin families each year, while the Middleton Outreach Ministry has a food pantry, clothing center and other programs that work together to fight homelessness in the Middleton, West Madison, and Cross Plains areas of Wisconsin. While the food drive may have finished, Nonn’s charitable giving has not. The company has a year-round program called “Nonn’s Cares,” that recognizes employees who volunteer for both local and national charities. Just recently, as part of the Nonn’s Cares program, the Nonn’s flooring team installed new carpeting in the Wisconsin offices of the Paralyzed Veterans of America (PVA). PVA is a non-profit organization dedicated to serving and advocating for wounded war heroes. Not only did Nonn’s donate their time, but they also donated the flooring materials to transform the space. Whether transforming consumer homes or dedicating time, talent, and resources to charitable organizations, Nonn’s is touching the lives of many.